Russ Chaplin's Driving Instructor Blog: Show Some Courtesy! I am regularly asked by my pupils if it's OK to wave at people who have made way for you in traffic. Absolutely YES is my answer. 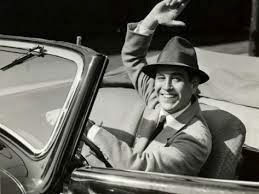 It's called a courtesy signal in the police drivers handbook and goes a long way to keeping everybody happy on the road. There's nothing worse than letting someone through and they just ignore you like you don't exist. Makes me angry it does. Well, for about ten seconds anyway. Good manners cost nothing and maketh the man as my grandma used to say. The best way to give a courtesy signal is to extend the fingers of the right hand while keeping a reasonable grip on the wheel. If you want to be super cool you can just extend the one finger. I have heard this technique referred to as the countryman's thank you. Must be popular out in the sticks. There is no need to give a full on happy wave. People will just think you're mad. There are other ways to show courtesy. You can leave junctions open in a traffic queue instead of plonking your car across it and making people wait. You can park your car in a decent place instead of right next to a junction. Try to do at least one nice thing tomorrow if you are out driving. It will make you feel better. Contact me if you want.